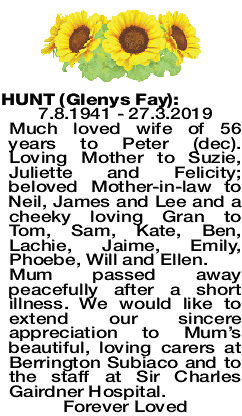 HUNT GLENYS FAY 7.8.1941 - 27.3.2019 Much loved wife of 56 years to Peter (dec). 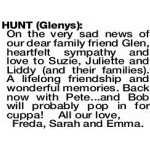 Loving Mother to Suzie, Juliette and Felicity; beloved Mother-in-law to Neil, James and Lee and a cheeky loving Gran to Tom, Sam, Kate, Ben, Lachie, Jaime, Emily, Phoebe, Will and Ellen. Mum passed away peacefully after a short illness. We would like to extend our sincere appreciation to Mum's beautiful, loving carers at Berrington Subiaco and to the staff at Sir Charles Gairdner Hospital. 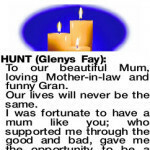 The Funeral Service to celebrate the life of the Late Mrs Glenys Fay Hunt formerly of Peppermint Grove will be held at KARRAKATTA Cemetery commencing at 3.30pm on FRIDAY afternoon (5.4.2019) in the Norfolk Chapel. No flowers by family request, donations in lieu to Alzheimer's WA. 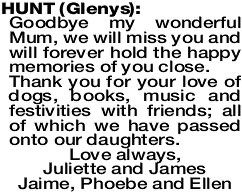 To our beautiful Mum, loving Mother-in-law and funny Gran. I was fortunate to have a mum like you; who supported me through the good and bad, gave me the opportunity to be a better person and instilled in me to have fun and not take life so seriously. Thank you for your love to me and especially to Lee (your favourite son-in-law, as you always used to say) and to our children. Rest in peace Mum, you are now back with your favourite - Dad. 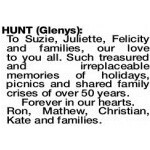 HUNT GLENYS Goodbye my wonderful Mum, we will miss you and will forever hold the happy memories of you close. Thank you for your love of dogs, books, music and festivities with friends; all of which we have passed onto our daughters. 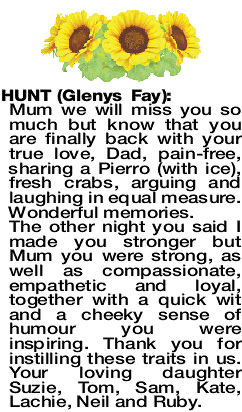 Mum we will miss you so much but know that you are finally back with your true love, Dad, pain-free, sharing a Pierro (with ice), fresh crabs, arguing and laughing in equal measure. Wonderful memories. The other night you said I made you stronger but Mum you were strong, as well as compassionate, empathetic and loyal, together with a quick wit and a cheeky sense of humour you were inspiring. Thank you for instilling these traits in us. 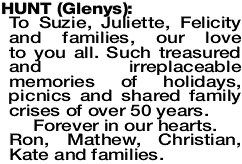 Your loving daughter Suzie, Tom, Sam, Kate, Lachie, Neil and Ruby. 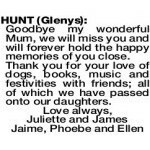 Our deepest sympathy to all the Hunt family. 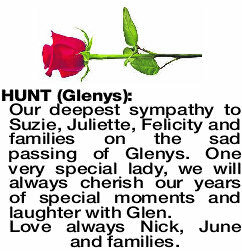 Glenys, we will remember you for your beautiful laughter and witty personality. 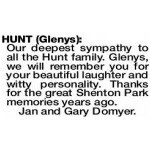 Thanks for the great Shenton Park memories years ago. 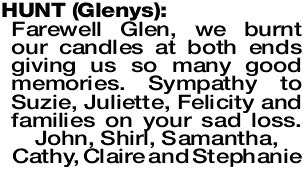 Our sincere condolences to the family in the passing of my new neighbour Glenys. Her cheeky smile will be sadly missed. May she rest in peace. 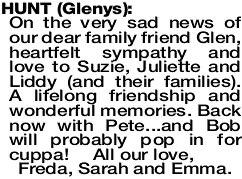 To Suzie, Juliette, Felicity and families, our love to you all. Such treasured and irreplaceable memories of holidays, picnics and shared family crises of over 50 years. Forever in our hearts. Ron, Mathew, Christian, Kate and families. 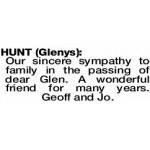 Our sincere sympathy to family in the passing of dear Glen. A wonderful friend for many years. 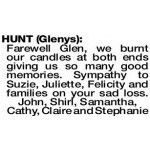 Our deepest sympathy to Suzie, Juliette, Felicity and families on the sad passing of Glenys. 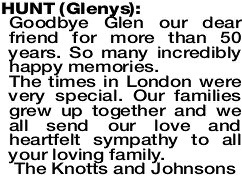 One very special lady, we will always cherish our years of special moments and laughter with Glen. Love always Nick, June and families. Many happy memories of a loyal and loving friend, so much fun and so much laughter. 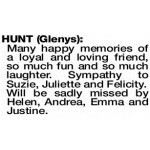 Sympathy to Suzie, Juliette and Felicity. 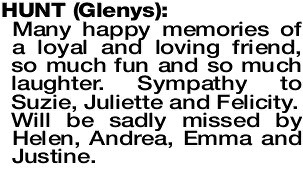 Will be sadly missed by Helen, Andrea, Emma and Justine. 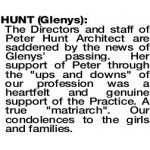 HUNT GLENYS The Directors and staff of Peter Hunt Architect are saddened by the news of Glenys' passing. 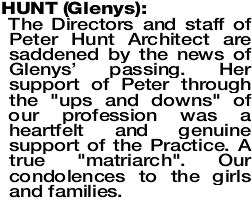 Her support of Peter through the "ups and downs" of our profession was a heartfelt and genuine support of the Practice. A true "matriarch". 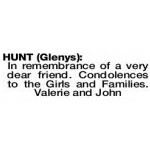 Our condolences to the girls and families. 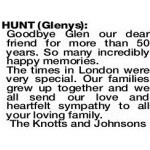 HUNT GLENYS Goodbye Glen our dear friend for more than 50 years. So many incredibly happy memories. The times in London were very special. Our families grew up together and we all send our love and heartfelt sympathy to all your loving family. 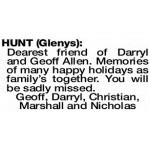 Dearest friend of Darryl and Geoff Allen. Memories of many happy holidays as family's together. You will be sadly missed.